Experience the new standard in motorcycle tires from Shinko, the DUAL COMPOUND 016 VERGE 2X! With Shinko tires all new dual compound technology you will get the best of both worlds, superior traction when needed, with all the mileage. Sipes added for better wet grip and even wear. The full steel belted rear tire and Aramid front tire will provide high speed stability and strength. So far, so good ... Don't let my stars steer you away. I've only had them for a week. Well, the tires that were in the bike were badly cupped and worn. I did a lot of research on tires and cost was definitely a factor. I wanted something that wouldn't leave me in the ditch if caught in the rain. Last night, they proved themselves in a big way .. was on my way home from work and got caught in a downpour. I'd definitely buy another set. Now let's see how they roll out on the long term testing. 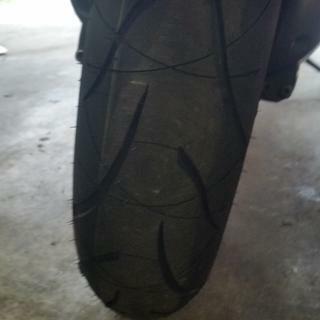 I had a set of Shinko Ravens on my FJR. They lasted 9K miles and then cupped badly (plenty of tread left on them). Performance was good but I won't use them again. The Shinko Verge has a better tread pattern that shouldn't cup. After 200 miles these are performing very well and if they give me acceptable mileage I'll definitely put on another set. Good Tire -Price is good. The tire is made in Korea. I have had the Shinko brand before and they are reliable. Good tire for the money. I'll keep an eye on it for mileage performace. Put the 180/55 on a Honda ST and took the coast to coast 50CC quest. Almost 5500 miles round trip in one week. Have the chicken stripe (to be expected) but great handling when needed, and did battle rain with no problems. I now have about 6500 miles on them and think I’ll get another 35-45 hundred more miles before another is needed. I will buy again. Good performance for my riding style and value priced.